EB08289 (1µg/ml) staining of HepG2 cell lysate (35µg protein in RIPA buffer). Primary incubation was 1 hour. Detected by chemiluminescence. HEK293 overexpressing IGF2BP2 (RC205673) and probed with EB08289 (mock transfection in first lane), tested by Origene. Important Comments: This antibody is expected to recognise both reported isoforms (NP_006539.3 and NP_001007226.1). Peptide with sequence C-KQQEQKYPQGVASQR, from the C Terminus of the protein sequence according to NP_006539.3; NP_001007226.1. Western blot: Approx. 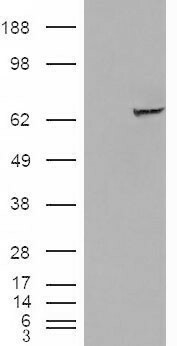 60-70kDa band observed in lysates of cell line HepG2 (calculated MW of 66.1kDa according to NP_006539.3). In transfected HEK293 transiently expressing IGF2BP2 a band of approx. 65kDa is observed. This band is not observed in the non-transfected HEK293. Recommended concentration: 1-3µg/ml.